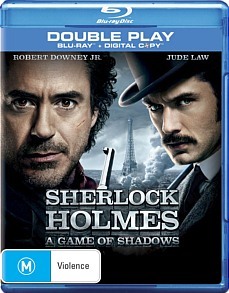 Sherlock Holmes A Game of Shadows Blu-ray Review. Sherlock Holmes: A Game of Shadows is a worthy sequel to this great franchise. It’s bigger, bolder and more ambitious, albeit not perfect. It’s an enjoyable romp of mystery and adventure that still holds the same charm that caught us the first time around. In the newest instalment of the Sherlock Holmes franchise, we find Holmes (Robert Downey Jr.) facing of, in a deadly battle of wits against his greatest adversary; Professor James Moriarty (Jared Harris). The film doesn’t stop to linger around as we are off on the adventure right from the opening. With Holmes already knee deep in his shadowy game with Moriarty, we are dropped right in the middle of it, picking up a year after the first film had ended. We find Holmes and Watson (Jude Law) have gone their separate ways and the good Doctor about to be married to his fiancé, Mary (Kelly Reilly) and things are set in motion from there. Sherlock Holmes: A Game of Shadows is everything that the previous film was, but bigger, bolder and a good deal more intricate. All involved in this film are on top form. Jared Harris gives a particularly villainous performance as Moriarty. In the public eye, he is a world renowned author and professor, much loved by his peers and the community, but behind all that, he is a genius criminal mastermind and you see that in his performance. The evil behind the public mask he shows to the world. Other supporting actors deliver great likeable performances from Noomi Rapace to Stephen Fry as Sherlock’s brother; Mycroft Holmes (who has the funniest scene in the film). The films best scenes come from the Holmes and Moriarty when they are together, sharing the screen. Playing their unspoken game of wits and cat and mouse, trying to stop and best the other, they are truly the best to behold. It’s though these two are so well matched for one another that you could easily believe that as much of a genius and good man that Holmes is, Moriarty could easily come out on top and be the victor of the two. He is Holmes’ intellectual equal, but he is not held back by good or morality, which makes him so much more dangerous. He is The Joker to Holmes’ Batman. If there were any negative aspects that I would point out it would be that the film is missing just a fraction of the spark that made the original so fresh when we first saw it and now, with the sequel, we know what we are in for, but the film makes up for that with it’s grander scale, leading actors, set pieces and cracking pace. Also the mystery Holmes and Watson are trying to solve is so intricate that if you let your attention slip for the slightest second and miss a detail, you may find yourself left behind later in the film, trying to figure out what is going on. But this is a minor issue as all is explained by films end. Picture quality is fantastic, with only the slightest film grain to be found, while on the opposite side, the audio is flawless. Period pieces always look and sound so good on Blu-ray. There is such a rich texture to this world that has been created for us with such detail that it is imperative to have such rich picture and sound quality to enjoy them fully. Blu-ray is truly the single best way for we film fans to truly fantastic cinema. Sherlock Holmes: A Game of Shadows is a worthy sequel to this great franchise. It’s bigger, bolder and more ambitious, albeit not perfect. It’s an enjoyable romp of mystery and adventure that still holds the same charm that caught us the first time around. * Maximum Movie Mode: Inside the mind of Sherlock Holmes - Hosted by Robert Downey Jr.